My skincare routine seems to have finally 'settled'. Whilst I do still enjoy chopping and changing my products around to suit my skin at the time, I've stayed quite loyal to these five, and they're doing a pretty good job. My Emma Hardie Cleansing Balm is currently running painfully low. I received some money off vouchers from Feel Unique the other day... it's like they knew. This will 100% be repurchased time and time again. The smell, the feeling of it on my skin, and the cleansing effectiveness - 10/10. Effaclar Duo [+] needs no explanation. See my full post HERE. I've actually been cutting down to using this 3-4 times a week instead of twice daily, as I no longer suffer from acne, (horray!!) and my dark marks have pretty much disappeared. It's a truly lovely product, and so easy to apply as it feels so light on the skin. I've recommended this product to so many people, and for good reason! Daily sun protection is super important to me, so it's no wonder my La Roche-Posay Anthelios XL SPF50+ Dry Touch Gel-Cream (phew!) is also almost finished. I've just reviewed some more from the range HERE, so I won't go on about this too much, but it's definitely one of the best facial suncreams I've tried. Now that I've cut down on my Effaclar Duo[+], it's made way for different exfoliants. I gave the Clarins Gentle Exfoliator Brightening Toner a go on Amy's recommendation, and it's given me really good results so far. I use this a couple of times a week after cleansing in the morning. Remember your SPF after using this though, as exfoliating makes your skin more susceptible to UV damage! I sometimes swap this for the Pixi Glow Tonic as well, depending on whichever one is closest to me at the time! Both make my skin smoother and much, much more even in texture. Finally, an occasional treat. The Clinique Moisture Surge Extended Thirst Relief offers a big kick of hydration, so I actually love to use this around my eyes and the tip of my nose, and on any dry patches overnight. I feel it would be a little too rich for use all over (at the moment anyway!) but I can tell we're going to be good friends come winter, when my skin is a lot dryer overall. Thanks for reading, and I hope you enjoyed this post! :) Have you given any of these products a go before? I have been planning on getting the Clarins toner too! I have tried a sample and already in love :-) I really like the Clinique moisturiser too.. in fact the intense version is even better.. as it still has the gel consistency but more hydration! I really need to try the Effaclar Duo+! I'm fed up of everyone raving about how it clears your skin up and I missing out haha! 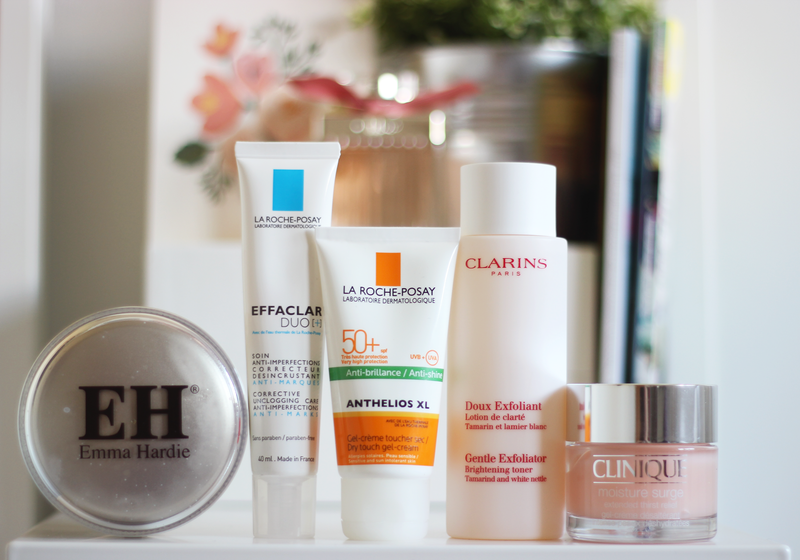 These look great, I'm definitely interested in trying the La Roche-Posay Anthelios XL SPF50+ Dry Touch Gel-Cream! The Emma Hardie Balm is on my wish list too, I'm so tempted to order it as we head into the colder months. I love the Clarins Toner too, I'm so glad you're getting along well with it :) Thank you for the mention!